Preheat the oven to 450. Put the plum tomatoes in a small baking dish and drizzle with the vinegar and 2 tablespoons of the olive oil. Roast for about 20 minutes, just until the skins loosen and the tomatoes are barely softened. Let cool slightly, then peel the tomatoes. Using the large holes on a box grater, grate the tomatoes back into the baking dish and stir. Season with salt and pepper. Meanwhile, heat 2 tablespoons of the olive oil in a large skillet. Add the bread crumbs and cook over moderately low heat, stirring, until golden and crisp, about 5 minutes. Stir in the lemon zest and a pinch of crushed red pepper and season with salt. Transfer the crumbs to a bowl and wipe out the skillet. In a large pot of boiling salted water, cook the pasta until barely al dente. Drain the pasta, reserving 1/2 cup of the cooking water. Return the pasta to the pot and stir in 2 tablespoons of the olive oil. In the large skillet, heat the remaining 3 tablespoons of oil until shimmering. Season the shrimp with salt and a pinch of crushed red pepper and cook over high heat, tossing once or twice, until barely cooked, about 1 1/2 minutes. Add the basil and pasta along with the reserved pasta cooking water and cook, tossing, until the shrimp are white throughout and the pasta is coated in a light sauce, about 1 minute. Transfer the pasta to bowls and scatter the cherry tomatoes all around. Top with the tomato sauce and bread crumbs. Serve right away. Brightly acidic tomatoes go best with lively white wines without oak. Look for Chardonnay aged in stainless steel.. 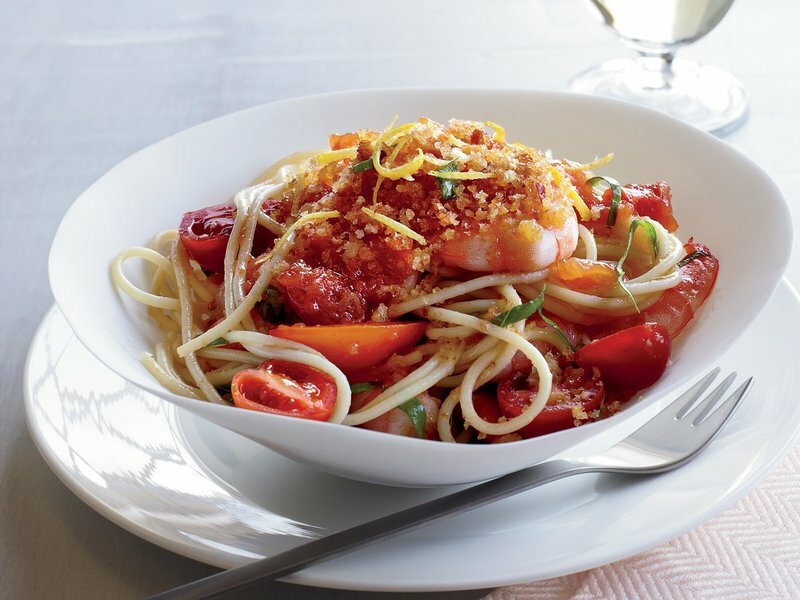 Chef Dan Kluger adds crunch to this delicious shrimp and summer tomato pasta with crisp lemon-chile crumbs. Preheat oven to 450 . Cut leeks in half lengthwise; slice into 1/4-in. (6 mm) pieces. Place into medium Bamboo Fiber Bowl and swish in cold water to remove dirt. Drain leeks in large Stainless Mesh Colander and place in Salad & Berry Spinner; spin dry and set aside. Slice garlic lengthwise into quarters. Place garlic and cream in a small saucepan. Simmer over low heat 7-8 minutes or until garlic is tender. Stir in 1 tsp (5 mL) of the mustard; remove saucepan from heat. Meanwhile, line Large Sheet Pan with foil. Combine bread crumbs, parsley and butter in Small Batter Bowl; mix well. Season fillets with 1/4 tsp (1 mL) of the salt and 1/4 tsp (1 mL) of the pepper. Brush remaining mustard over fillets; top generously with bread crumb mixture. Bake 12-14 minutes or until fish flakes easily with a fork. Add oil and leeks to (10-in.) Skillet; cook over medium heat 2-4 minutes or until softened, stirring frequently. Add broth and 1/4 tsp (1 mL) of the salt; cook 3-4 minutes or until most of the liquid is evaporated. Add cream mixture and remaining salt and pepper; simmer 5-6 minutes or until cream is thickened. 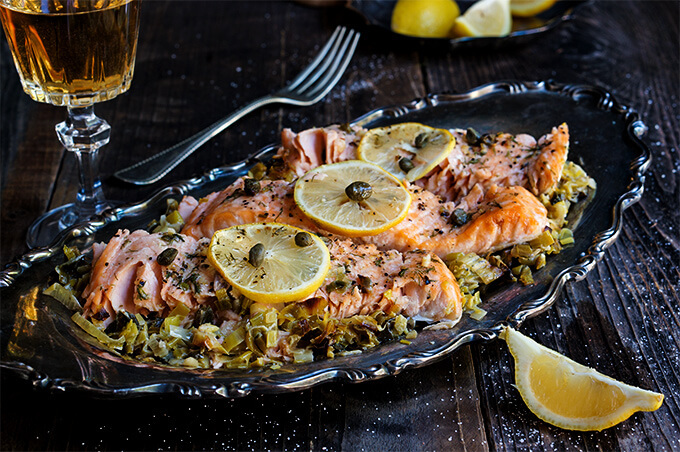 Serve salmon with leeks. Drying the leeks in the Salad & Berry Spinner allows for less moisture in the leeks, shortening the time it takes to reduce the liquid and creating a creamier leek mixture. Ask for center-cut fillets when purchasing the salmon. This way, each fillet will bake evenly. Chef Jason - Fresh garlic is poached in cream, giving the leeks an even sweeter flavor.